60 Satpol PP personnel have been alerted along Jalan Sudirman-Jalan MH Thamrin, precisely from Patung Kuda (Horse statues) until Dukuh Atas.
" The ring one must be sterile from public order disturbances"
It is optimally done to support the forthcoming Asian Games through persuasive and humanist methods to maintain public order in those areas. "The ring one must be sterile from public order disturbances," expressed Jakarta Satpol PP's Enforcement and Action Section Head Budhy Novian, Monday (8/6). It is hoped could create the impression of a friendly, cool and safe atmosphere for guests of Asian Games. "This is just temporary. 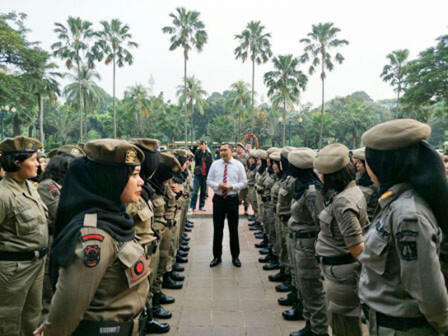 But, after this event, they will return to duty at the original place, Jakarta City Hall," he stated.